From a drama studies vantage the attempt is made to situate Wagner's utopian vision of music drama in aesthetic terms. The central criterion drawn upon for the description of the place Wagner occupies in this connection is Walter Benjamin's 'aura' metaphor, which links up Wagner's aesthetic roots and his criticism of contemporary opera with the synthesis of his own theory of art and the impact he intended his works to have. 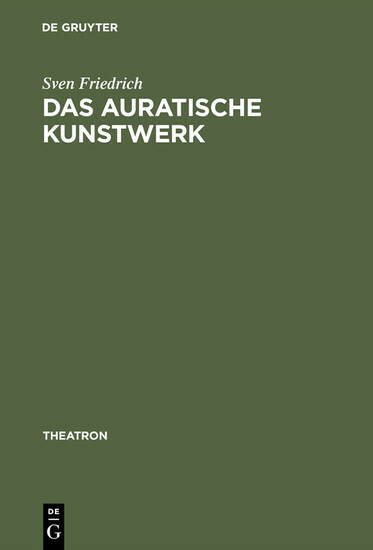 Thus it is possible to delineate how Wagner's theory of a synesthetic 'aural artwork' is reflected in the semantic principles underlying his musical dramaturgy and in the way his religious/cultic understanding of art and (music) drama manifests itself in the idea of the 'festival play' (Bühnenfestspiel) and the 'festival celebration' (Bühnenweihfestspiel).